"To apply the fiscal rules in a rigid manner today would be perverse. We would have to take money out of the economy, exacerbating an already difficult situation." Of course, he's attacking a straw man - nobody is actually suggesting "taking money out of the economy" now. The real issue - the one he didn't address - is how a government with a record for reckless spending is proposing to establish at least some modicum of fiscal discipline over the medium term. On that he was silent. It was a case of "trust me". Unfortunately we've heard that one before. The IFS chart above shows the record of previous governments since WW2. 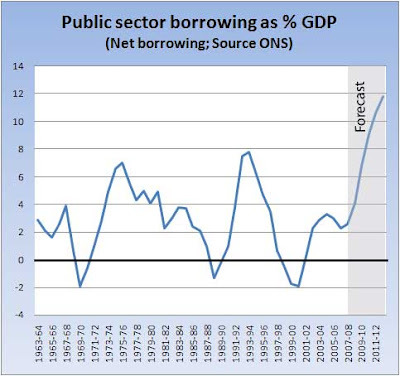 Last year the public sector borrowed £35.8bn, or 2.5% of GDP, so you might argue they were still broadly in the historic range - even though they were actually borrowing that in a boom year for the economy. But the important question now is how much are they proposing to borrow in the future? The key unknown is how much GDP is going to shrink. Nobody knows, but we do know it's going to be bad, so a reasonable sighting shot might be the worst recession we've had since WW2 - the one we had in the early 80s. Then, GDP fell by 4.6% in two years. So we've assumed that GDP falls by a total of 4.6% by the next Election (ie April 2010). But the HMT budget projection assumed continuing growth in GDP, so factoring in a decline means that the shortfall relative to the Budget forecast is much bigger. In fact by 2011-12, the GDP shortfall realtive to the last Budget is 14%. According to the HMT ready reckoner, if GDP is lower by 14%, borrowing is higher by a staggering 9.8 percentage points of GDP, or well over £140bn in today's money. Just pause to take that in: on the government's current spending and tax plans, borrowing is set to soar far above the previous post-WW2 record - the 7.8% reached in 1993-94 under the "boom and bust" Tories. A new record will be set in 2010-11, and by 2012-13, public borrowing will be running at a banana republic style 11-12% of GDP. And also understand this: our projection takes no account of some big ticket items. It takes no account of all the billions being poured into the banks. It takes no account of the forthcoming Keynesian spending splurge. And it takes no account of the very real risk that bond investors will rack up our borrowing costs (see this blog). Taking account of any of those increases the borrowing estimates by further tens of billions. Of course, it won't happen. It won't happen because the markets won't let it. Borrowing on anything like that scale would smash sterling through the floor, ramp up inflation, ramp up borrowing costs for everyone, and might even lead to that old favourite from the 70s, a buyers strike, in which bond investors simply refuse to take any more UK government bonds. Yes, that's right. 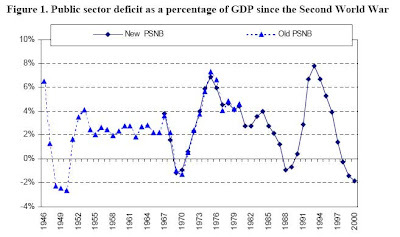 It's back to the 1970s - emergency spending cuts and tax rises. Big ones.